Whether to serve as a side dish or even as finger food for parties, these mushroom skewers would be just perfect. They do not require much preparation and they taste sooo lovely and cheesy! Add some chilli to make them slightly fiery! Clean and remove stem by wriggling it gently from each mushroom. Chop the stems finely and sauté in a pan in a little olive oil, together with the garlic clove until soft. Leave to cool. Mix together all the remaining ingredients in a bowl and then add the mushroom and garlic mix until well combined. Using a small spoon, stuff the cream cheese filling into each mushroom cap. Very carefully thread the mushrooms either in twos or threes on bamboo skewers. Preheat oven to 180C. 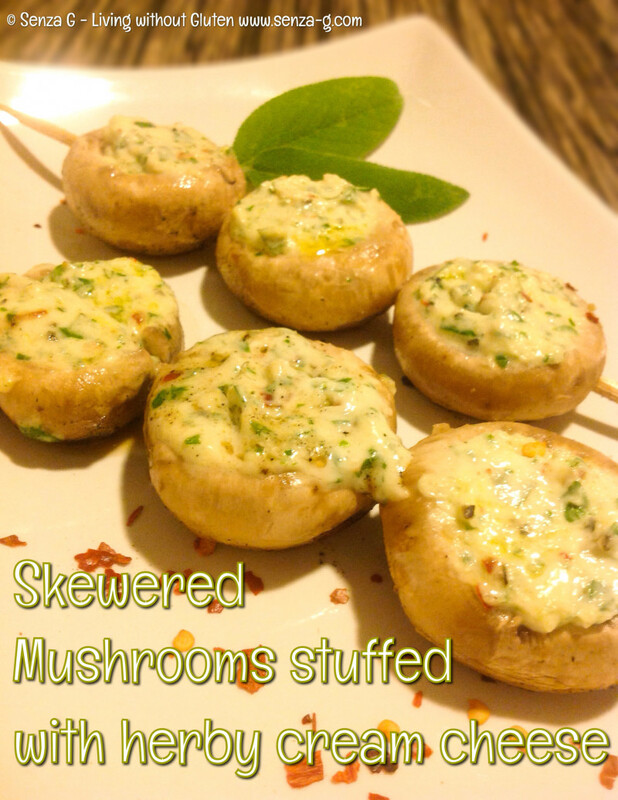 Place mushrooms skewers on a slightly greased baking sheet. Cook in the oven for about 15 to 20 minutes until the cheese filling starts bubbling and is oozy.